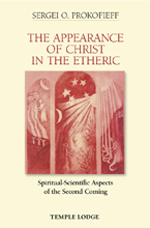 • Recognising in anthroposophy the spiritual language in which questions can be posed to the etheric Christ today. Prokofieff describes these and other critical undertakings, such as forging a strong relationship to Michael and the importance of recognising the adversarial forces that attempt to falsify Christ's Second Coming. The Appearance of Christ in the Etheric is of relevance to every individual who wishes to take an active part in fulfilling the needs of our time. SERGEI O. PROKOFIEFF, born in Moscow in 1954, studied painting and art history at the Moscow School of Art. He encountered anthroposophy in his youth, and soon made the decision to devote his life to it. He has been active as an author and lecturer since 1982, and in 1991 he co-founded the Anthroposophical Society in Russia. In Easter 2001 he became a member of the Executive Council of the General Anthroposophical Society in Dornach. He is the author of many books, of which this is the 25th to be published in English translation.